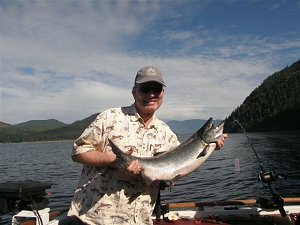 18th September, 2011: FISHING REPORT: Port Alberni Inlet, Barkley Sound, Ucluelet (West Coast), Somas-Stamp River System. 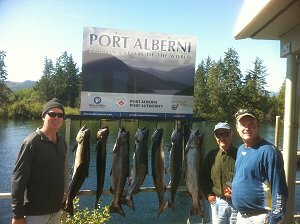 It is already mid-month September but the salmon fishing in many of the Port Alberni and Pacific Rim fishing areas are still relatively good for Coho and Chinook sport fishing. The weather on Canadas’ West Coast has been sensational and very warm especially in the afternoons, as Port Alberni located in the heart of Vancouver Island has had temperatures above the mid thirty degrees celsius. The early to mid mornings and early to late evening has produced the best fishing in saltwater locations. When the weather does change the salmon will begin to move in bigger numbers to their natal streams and rivers and creeks which will produce a great fall fishery in fresh water locations especially the Stamp, Nahmint and Sarita River systems. September has also seen the areas two biggest salmon Derby’s come and go. The Port Aberni Labor Day Salmon Derby was very exceptional with well over 2,500 salmon weighed in. This years $10,000 winner for having the biggest fish on the Saturday which was Day 1 of the Derby and also having the biggest salmon over all was Port Alberni resident Guy Desbiens who landed his 35.8 pound tyee on a purple haze hootchie in the Port Alberni Inlet. The Ucluelet Ladder Salmon Derby fish off occurred the weekend of September 9th to 11th. This was year two of the Derby with $10,000 in prizes and cash going to the winner. There was a total of $60,000 in prizes. Much of this year proceeds went to the Thornton Creek Fish Hatchery located in Ucluelet. The top three fish were over forty pounds. Rich Allen was first with his 41 pound 9 ounce Chinook landed at the Starfish, Second place went to William Webber whose fish was also landed at the Starfish and came in at 41 pounds 3 ounces. 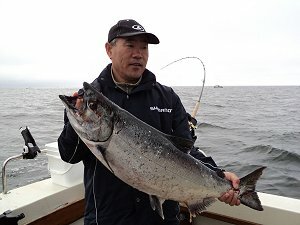 Ken Nakagawa landed a nice Chinook at the Hyason Bank. His salmon was very close the the first and second place fish and came in at 40 pounds 15 ounces. The top ten fish of the Salmon Ladder Derby ranged from 31 to almost 42 pounds with six of these Chinook landed at the Hyason and the other four at the Starfish. It is expected that the big Chinook will continue well into September and that the outer and inner South Bank and also the Wreck and South-West corner will see many of these salmon move through these hotspots as they migrate to their rivers and streams. The 2011 season is not yet over. We expect some great fall fishing for Coho and the late summer Chinook. There is still plenty of good weather during the fall especially on Vancouver Island which has become British Columbias premiere salmon fishing destination. The Alberni Inlet caught fire about the 18th of August and the Chinook fishing just got better and better right up to the Labour Day Weekend Derby. Because of the age and structure of the dam water was released on the Friday just before the derby which cooled the inlet and river water temperature down dramatically. This pushed a lot of salmon into the Somass system. The derby was still very successful but the salmon fishing was not anywhere near as good as it had been. This past week has had a variety of reports with some much improved fishing. Chinook and Coho are being landed right in the harbour inside Pollys Point and also from Lone Tree Point to the Coulson Mill. Cous Creek and Mc Tush have also been quite good for Coho in the early part of the morning and then again later in the evening. Anchovy have been very good and are currently creating a lot of success for various anglers in a Rhys Davis green haze, purple haze, green, army truck and bloody nose teaser head. In spoons the night rider, cop car, green glow, pearl, and nasty boys in the four inch have all been working with a variety of leader lengths from 44 inches to just over five feet. In plastic (hootchies) the spatterback, white AORL 12, jelly fish, and green oil slick have all been responsible for landing some nice silver salmon. We are expecting some continued great Inlet fishing until we receive substantial rainfall or when an abundant amount of water is released from the dam. The many salmon sitting in inlet waters will quietly make their way into the river system which will creat a fantastic fresh water sport salmon fishery. 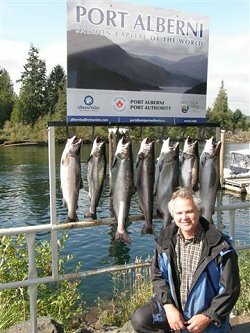 Coho fishing in the Port Alberni Inlet has a retention number of four per day with a two day possession limit of eight. Barkley Sound areas have been hit and miss over the last two weeks. Popular angling locations close to Poett Nook have produced some great Coho catches. Pill Point to Alan Point has been very consistent for Chinook and Coho. Chinook have been averaging in weight from 14 to 24 pounds while the Coho are 8 to 10 pounds with the odd Coho coming in at 15 pounds. During the Alberni Labour Weekend Derby there were a few Coho taken at Swale Rock and Gilbraltor weighing almost 20 pounds. The last few days Pill Point has had a good number of Coho and teenager sized Chinook. Bait seems to be the way to fish at the current time. Guide Doug of Slivers Charters Salmon Sport Fishing has been landing salmon on bait only in either an army truck, green haze or bloody nose Rhys Davis teaser head with a six foot leader behind a purple or gold kinetic flasher. One hootchie that has been effective is Pistachio with 42 to 44 inches of leader. The AORL 12 has also been a good hootchie and is often the best in September if using hootchies. With a good number of fish still offshore and many reported to the north of Ucluelet close to the beach we are still expecting some good numbers of salmon to swim into the sound before swimming up the inlet to the Somass River system or some other river, creek or stream. 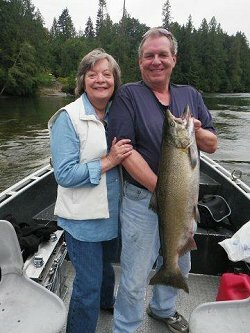 Year after year Ucluelet fishing continues to impress most anglers who are either using their own sport boat or on a guided salmon fishing trip. The many different banks outside the Ucluelet Harbor are often full of rich bait fish which are the areas that the different runs of salmon will feed and rest before making their long migration journey to their natural river. Ucluelet (weather depending) is one area where fisher people have opportunity year round to land a twenty pound salmon. September and into early October is often the time of year where those big Chinook over forty pounds and also the big fall Coho will still be found. The summer and late spring months often find plenty of big Schools of Chinook and Coho averaging 18 to 30 pounds (Chinook) and 8 to 12 pounds (Coho) but it is of ten the fall when one will find that trophy Tyee or Northern Coho. This fall should be of no exception. This has been a marvellous year for fishing. The water has been flat and the many days have had little fog. September and early October have often been described as that time of year with no fog and no wind. It is thought that September will have some great fishing. The Ucluelet fish off derby proved that with many big fish being weighed in. The same final ladder derby in 2010 did not produce the landed Chinook catch sizes that this particular year did. Many guides are still using big gear as there are still plenty of good sized Chinook swimming the offshore and inshore water. Big gear can be termed as six or seven inch plugs and spoons. Many guides will move to the use of smaller gear as they begin to concentrate on Coho. The Inner and Outer South Bank should have some great September fishing as should inshore spots such as Mara Rock, the Lighthouse Bank and also the Turtle Head which is only four miles out of the harbour mouth. The fishing up to the past day or two has been excellent for Chinnok with the Starfish and Hyason Bank producing some good sized Chinook jut over forty pounds. Schools of Coho have sitting and feeding at the Inner and Outer South. These Coho are in the top sixty feet of water and are hitting hootchies and four inch coyote spoons. We are expecting some great sport Coho fishing right into mid October. Book your Chinook Coho trip before the end of the season or consider a trip for next year. Fishing in the River system for salmon got underway on the 26th of August. As fish make their way little by little into the system the fishing has gradually become better. The counters have shown at least 6,000 Chinook having passed through. It seems that early this week the heavy migration has begun. The Chinook and Coho fishing is producing some nice sized salmon that are very bright and silver in color. All of the guide boats are currently either jet or drift and of course the fishing method is either fishing on the drift or on a bank or area where there are some deeper pools. Bait casting is one great method using spinners and spoons as well as blades. Spin n glos or using orange or red wool in the fast water is quite productive. The last two days has seen those guests on guided trips, with guides who have plenty of river experience, leave the river with some great memories. There has been plenty of action for everyone and it is going to get even better. For those that enjoy fly fishing the best time of year is just before the Thanksgiving weekend throught the first week or two of November.